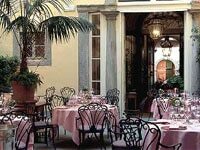 Ease into your day with breakfast at the elegant Caffè Rivoire, near the Piazza della Signoria, before tackling the Uffizi Galleries. Unless you're a serious Renaissance art aficionado, you don't have to dedicate the entire day to the Uffizi, whose numerous galleries are seldom all open at the same time. The arresting U-shaped palace was commissioned by Cosimo dei Medici in the mid-sixteenth century. Today it houses the world's largest collection of Italian art, including early works by Giotto and Cimabue, masterpieces by Raphael, Caravaggio, Tiepolo and Titian, the wildly popular Birth of Venus by Botticelli, and many other paintings that date from the thirteenth to the nineteenth centuries. You might want to stop in at the nearby Palazzo Strozzi, the epitome of Italian Renaissance architecture with its perfect rectangular shape and flawless symmetry. Commissioned in the late fifteenth century by one of the wealthiest merchants in Florence, the palace is a symbol of the city's emergence from the dark ages into a more human and culturally aware century. Today it has several functions, including that of a museum hosting exhibits on an array of subjects ranging from the Renaissance to Impressionism to contemporary fashion. Lunch in the neighborhood on the chic Via Tornabuoni at Procacci, a traditional tea salon and wine bar that dates back to 1885. Or make your way back towards the Uffizi Galleries and seek out Baldovino Enoteca, a favorite of Florentines for a quality lunch near the Basilica of Santa Croce. Florentines also favor the Museo Marino Marini, located in Piazza San Pancrazio just east of Via Tornabuoni and offering a welcome respite from the host of huge, historic art museums that inhabit the small city. The successful mix of old and new architectural elements reminds visitors that Florence also exists outside the stone walls of its world-famous palaces and churches. The city's economic prowess is perpetuated by the young, trend-conscious entrepreneurs responsible for maintaining a modern mentality amid the venerable backdrop. 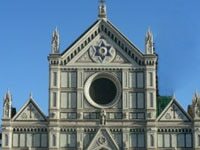 Not to be missed is a stroll through the extensive Piazza Santa Croce, whose gothic basilica is one of the largest and most important in Florence. It contains many artistic masterpieces, most notably the crucifix and altarpiece by Giotto. The painted wooden beams of the ceilings add a warm, rustic aspect to this veritable mausoleum of historical figures. The monuments to Dante and Michelangelo are especially touching. Be sure and take in the fourteenth-century stained-glass windows and the numerous chapels located around the church decorated with splendid frescos and paintings. Plan your night around dining and entertaining by taking Via Ghibellina to reach the acclaimed Enoteca Pinchiorri, where a surprising, inventive twist on Italian cooking is the main draw. East of here, near the Piazza Lorenzo Ghiberti, Cibrèo features highly creative Tuscan cuisine. Don't come here if you're in the mood for pasta — there isn't any. Also part of the Cibrèo clan, the Teatro del Sale by Fabbio Picchi offers an alternative form of amusement. Act like a Florentine and pay the nominal membership fee in order to access this unusual enclave of entertainment, which entitles members to enjoy a club-like atmosphere in which to be wined, dined and entertained. Worthwhile buffet-style breakfast, lunch and dinner are served everyday except Sunday, and the evening show (ranging from opera and concerts to theater and dance) starts at 9:30 p.m.
For true classical music and opera aficionados who happen to be in Florence in May and June, the high profile music festival, Maggio Musicale Fiorentino, may prove to be a holiday highlight. One of the oldest music festivals in Europe (dating from 1937), the Maggio Musicale celebrates Florence's rich musical heritage and features a different theme each year with an international roster of superstar composers and artists performing in the vast Teatro Comunale. In addition to hosting the Maggio Musicale, this 2,000-seat auditorium boasts an impressive orchestra, choir and dance company that performs throughout the year. During summer months, a special program is held in the spectacular Boboli Gardens.